If we're going to send the first humans to Mars in the early 2030s, NASA is going to need the next President of the United States to be a strong supporter of space exploration. While Congress controls the federal government's purse strings, the president plays a key role in shaping the future of NASA by proposing a budget, which is then discussed by key stakeholders for months before it's put to a vote. "Historically we all tend to remember the Kennedy moment of giving a big speech and announcing a goal for the nation," James Muncy, co-founder of the Space Frontier Foundation told NBC News. "Space is now increasingly commercial as well as a government endeavor." The current proposed budget for NASA in 2017 is $19 billion — down $300 million from the previous year but still an improvement from the past decade which saw the end of the space shuttle program. The next president will be stepping into the role during a pivotal time for NASA as the space agency looks toward a Mars mission and prepares to end its dependance on Russia for rides to the International Space Station. NASA has laid out its plan for Mars in a 36-page report, detailing milestones the space agency must hit over the next few years to help ensure a future trek into deep space is a success. In an interview with Aerospace America, Trump called NASA "one of the most important agencies in the United States government for most of my lifetime" and said it should "focus on stretching the envelope of space exploration." When asked whether he'd fund a mission to Mars, Trump made it clear issues in the United States would win over our interests in space. "A lot of what my administration would recommend depends on our economic state. If we are growing with all of our people employed and our military readiness back to acceptable levels, then we can take a look at the timeline for sending more people into space," he told Aerospace America. Clinton hasn't dived into specifics about the Mars mission; however, the Democratic Party Platform promises to support NASA and continue the spirit of exploration. "We will strengthen support for NASA and work in partnership with the international scientific community to launch new missions to space," the platform says. In the near-term, NASA plans to test its Orion spacecraft and Space Launch System rocket, in addition to visiting an asteroid and redirecting a chunk of it into orbit around the moon. Astronauts could later visit the boulder and use the mission to test some of the tools needed for a Mars mission. All of this is in addition to the countless experiments being done to understand how the human body and mind can handle a mission that could last years. Since NASA's shuttle fleet stopped operations in 2011, the space agency has been buying seats aboard a Russian Soyuz capsule to send American astronauts to and from the International Space Station. NASA has contracted with SpaceX and Boeing to handle the first crew missions to the International Space Station, which could happen at the end of next year or in 2018. Developing a safe and reliable way to send astronauts to space could also be incredibly cost effective for NASA. SpaceX's Crew Dragon and Boeing's Starliner would cost about $58 million per seat, according to NASA. By comparison, a seat aboard the Russian Soyuz has the heftier price tag of $81 million. Trump ranted about "dependence" on the Russians in a 2012 tweet. Representatives for both campaigns did not immediately respond to NBC News' request for comment. While neither candidate has expanded on a space platform as extensively as other issues, Clinton has spoken about her childhood dream of being an astronaut. “I had always been fascinated by exploration and space travel, maybe in part because my dad was so concerned about America lagging behind Russia," Clinton wrote in her memoir, "Living History." 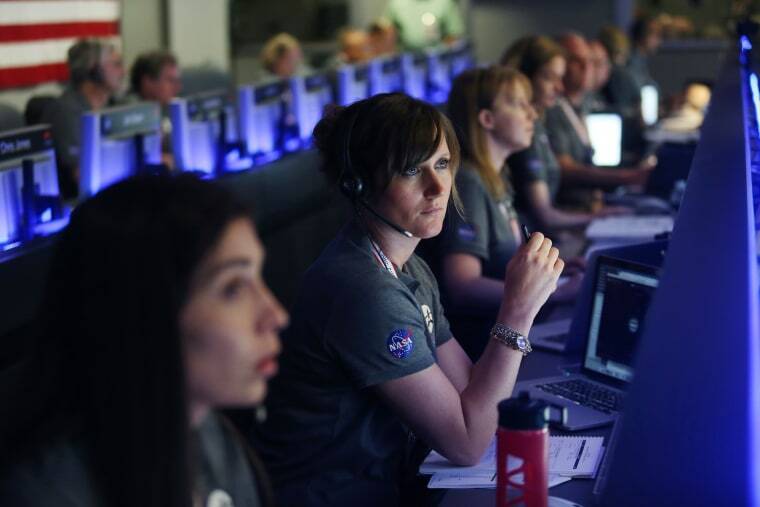 "I wrote to NASA to volunteer for astronaut training. I received a letter back informing me that they were not accepting girls in the program," she wrote. "It was the first time I had hit an obstacle I couldn’t overcome with hard work and determination, and I was outraged." NASA announced its first all-female class of astronauts in January 1978. Trump also has a unique connection to space. There's a petition to send Trump to space and leave him there. Even Jeff Bezos, the billionaire Amazon CEO who also runs Blue Origin, a private space company, offered Trump a free trip, something space nerds could only dream of.